Published on April 16, 2014 in general info. Closed Tags: Boston, Boston condo market, Boston condo sales, Boston condominium market, Boston real estate, Boston real estate sales, South End condo sales, South End condos, South End real estate. The national real estate pundits are talking about the lack of available inventory and declining sales numbers. 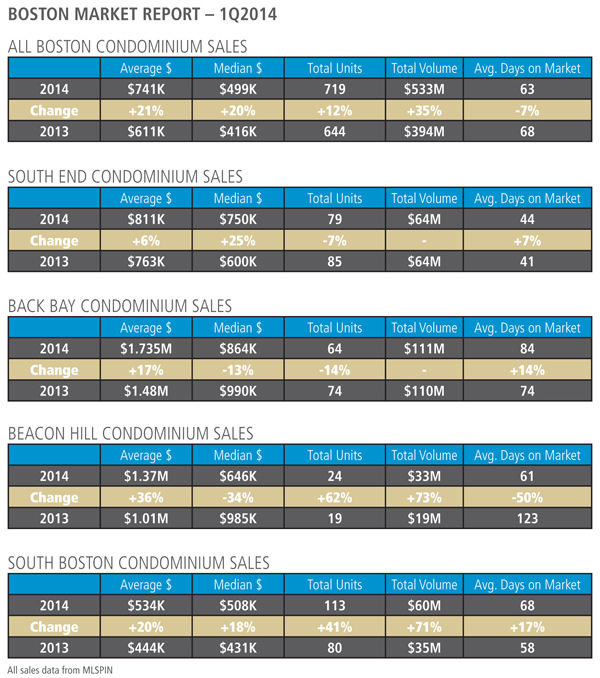 These first quarter results for downtown Boston condominium sales tell a different story. The average sales price for condos in downtown Boston neighborhoods increased 21%. Sale were up by 12%. Total sale volume was up by 35%. The South End and Back Bay neighborhoods reflect the more standard state of the real estate industry here in eastern MA. Prices are up because of buyer demand, but sales are down and volume is flat – the effect of the critically depressed inventory of available condos for sale. South Boston is standout neighborhood! Average sales price up 20%. Sales up 41%. Volume up 71%…and interestingly enough the only neighborhood with an increase in days on market, a result of additional inventory. The all important spring market will be very important in determining the state of the real estate market in Boston.